This just might be the most easy pork tenderloin recipe you have ever made. Short notice, you just find out company is coming to dinner and you need something fast that won’t disappoint. All you need is some pork tenderloin and a bottle of salad dressing and you’re set. Recipes for pork tenderloin should all be this simple. 1. In a large resealable food bag or glass container with a cover add the pork. Pour salad dressing over the meat, seal and refrigerate 1-4 hours turning occasionally to distribute the marinade evenly. If using a resealable food bag press out as much air as possible. 2. Preheat oven to 425 degrees. Drain and discard the marinade, place meat in a baking dish. How ever you can keep all the salad dressing and pork tenderloin and transport to a baking dish, this will give the tenderloin more flavor. 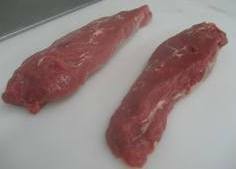 Cook the tenderloin 20-30 minutes until the centre reaches 145-150 degrees on an instant-read thermometer. 3. Remove meat, tent with foil 10-15 minutes, temperature should rise another 5-10 degrees. 4. Slice pork thinly across the grain and serve with rice or vegetables. Below is a cooking chart for pork. Remember you should always use an instant-read thermometer to check the doneness of a roast, pork tenderloin cooking times are only guidelines. The internal temperature will rise about 5-10 degrees during resting time, remove the roast 5-10 degrees before desired doneness. It is not recommended pork be cooked less than medium doneness. How to grill pork tenderloin to perfection for maximum flavor and tenderness on your outdoor grill.